Hi all, i am now living in this house in Bedfordshire, UK for 2 years and i have small and big spiders in the garden and also inside the house and i believe they enter inside the house because of my dogs. I have seen some big spiders like this one on this BBC report but they are not poisonous but scary if they are on top of you. I never kill any insects or spiders i just grab a glass and a paper and put them outside. There are some long legs ones, really thin spiders that are indoor spiders, they will die in the outside so i just let them be or just put them in my garage, they help keeping the bugs in lower level. Now, what i really wanted to talk about is about the spider in the picture, it is called “fake black widow” it is dark brown or black and has a image in is back. 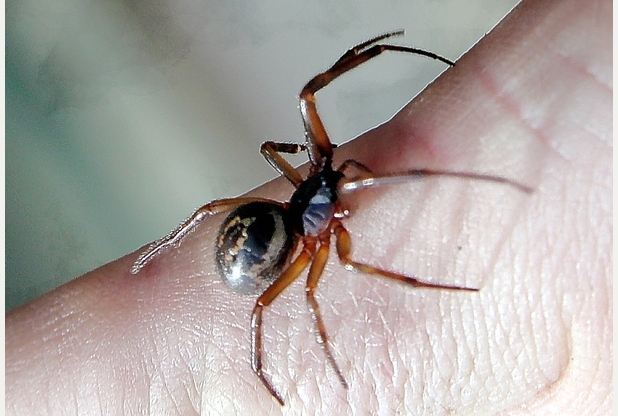 This spider is small , not aggressive, but is poisonous. I have grabbed some with my hand to put them outside and they are just really afraid of you. It is really rare when they bite and that happens when they are stepped on or trapped inside your clothes. The bite injects a bacteria called “flesh eating bacteria”. Usually you end up loosing a finger or worse so it is good to be careful and be aware of the first signs of a bite and run up to the hospital. See this BBC report or this page for more information. If you want to see how the injuries look like just write on goggle images “fake black widow spider injuries” i will not put them here because they can be shocking. I decided to do this post because i always had this spiders in my house but never knew they were poisonous so maybe you also have them in yours. The number is increasing due to the climate change and when they are more active and bigger is in the Autumn. Thank you and till next time.